In the effort to keep things minimal while we’ve been trying to keep our house looking show-ready, I didn’t do any of my usual fall decorating this year. Other years, this usually includes a runner with spider-web motif, metallic pumpkin, and the clichéd decorative farmers-markety gourds. Faux-fall foliage wreath on the door, that sort of stuff. Thankfully, the kids took care of fall decor this year.. and I didn’t even have to ask! 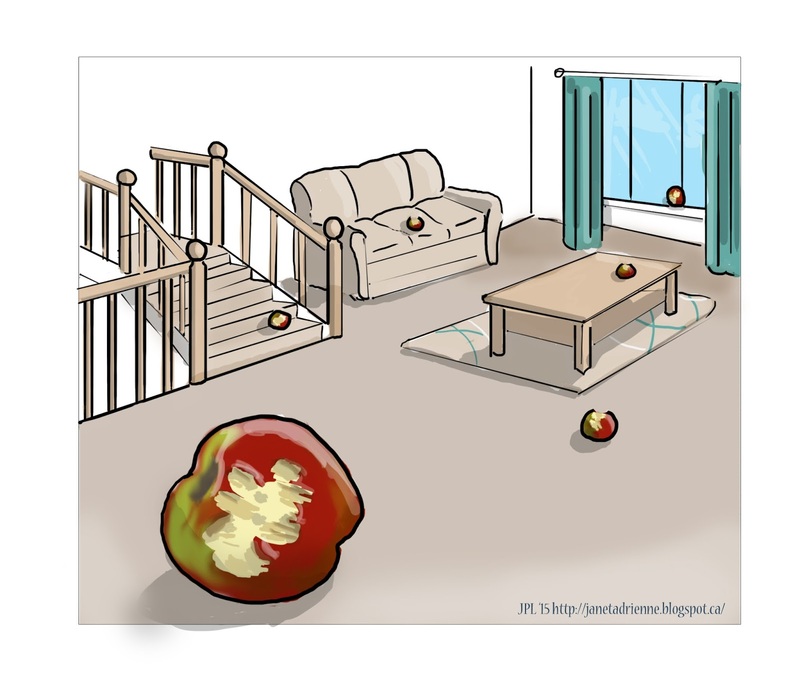 Fall means apple picking, which means many apples with one bite out of them left to oxidize in random spots around the house (windowsills, steps, amongst Lego…). The kids love apples, but they either forget about them easily or don’t like apples with bites out of them. We’ll find it later, when it’s then too brown and therefore even more inedible. So that’s been our fall decor this year. It’s a good look. Coincidentally, as I drew this, Little Bro came up to see what I was up to and climbed up on my lap, chewing on yet another apple. Then he hops down and leaves his own apple sitting by me on the desk. I’m looking at it right now. Well I think if you’ve got your kids liking apples, you’ve done something right and as they say “an apple a day keeps the doctor away” One bite at a time !!!!! !